“Blood, sweat and tears” appears on many a weight room motivational poster, but isn’t quite as applicable to esports as it is to more traditional sports. There are certainly tears, after wins and losses, and injuries are becoming commonplace as pros get older. Curious, we reached out to esports competitors in all sorts of games to ask a simple, burning question: Where’s the sweat at? There’s no comparison, of course, between running 26.2 miles and firing off a hadoken in Street Fighter, or between being tackled by a 330-pound lineman and getting killed in Dota 2. Still, a combination of nerves, hot studio lights, and the constant contact against surfaces like controllers, fightsticks, and keyboards does result in some perspiration. Teammate Eugene “Pobelter” Park raised a different concern: he gets a bit chilly at times. Verros “MaybeNextTime” Apostolos, of the independent Dota 2 team formerly known as Ad Finem, was happy to indict others. “I never had an issue with sweaty hands or something like that, even though I know a lot of people who get that,” he said. League of Legends and Dota 2 doesn’t have the same kind of constant-contact as other games, however, so we talked to some controller junkies as well. Smash 4 player Jason “ANTi” Bates says he does not sweat, though he does get nervous, but was happy to point us in the direction of a heavy sweater: fellow Smash 4 player Eric “Tyrant” Legesse. This seemed a little strange, so we reached out to Legesse, and sure enough, he confirmed it. Hand sweat isn’t as much of a concern for Legesse, but it can leave players’ controllers pretty dirty when it gets bad. 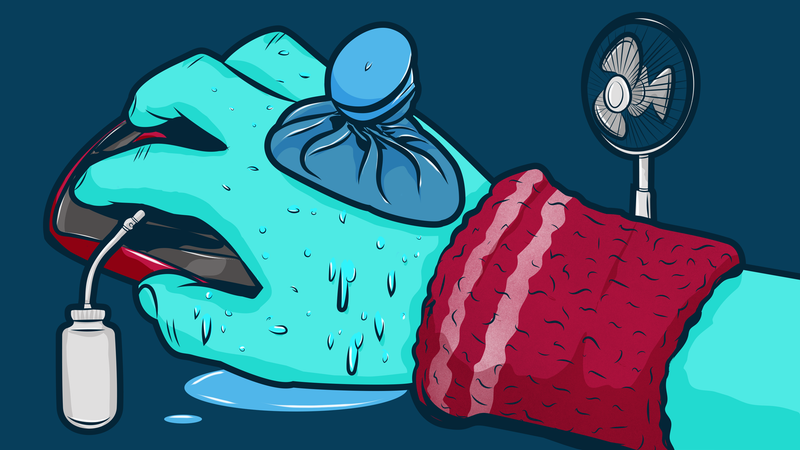 Most pros find ways to deal with hand sweat if it becomes a persistent issue. Echo Fox’s Jeremy “Neslo” Olsen, part of their Call of Duty roster, also said he knows of other players who sweat, and that “a little sweating” can occur for him. Two members of Immortals’ Vainglory squad, who play their game of choice on solely mobile devices, said that armpit sweat was not uncommon. In all the interviews, I also asked some general questions about exercise, health, and injury prevention, to understand whether esports pros are keeping an eye on their body’s reactions to the stresses of play. Overwhelmingly, players responded with detailed anecdotes, discussed areas where they frequently feel tension, workout and nutrition plans they were instituting, and more. Laurent “Aloh4” Ortega, a Vainglory player, said back and neck pain usually leads to him taking Advil. As a group, players seemed to have an awareness that even though their profession involved long hours of sitting, their health was of vital concern to their performance. “In college, I was an avid bodybuilder, so health and nutrition became a lifestyle for me,” DaJuan “Shroomed” McDaniels, a Melee player, said. And Legesse, our most up-front admitted sweater, takes steps to ensure his health by playing basketball, baseball, and running. Esports are fundamentally different from most traditional sports, but just like those pros, esports competitors are acutely aware of how their bodies affect their performance ... and how their performance affects their bodies.